Serene natural beauty meets a rich history of Japanese traditions in Gifu Prefecture. 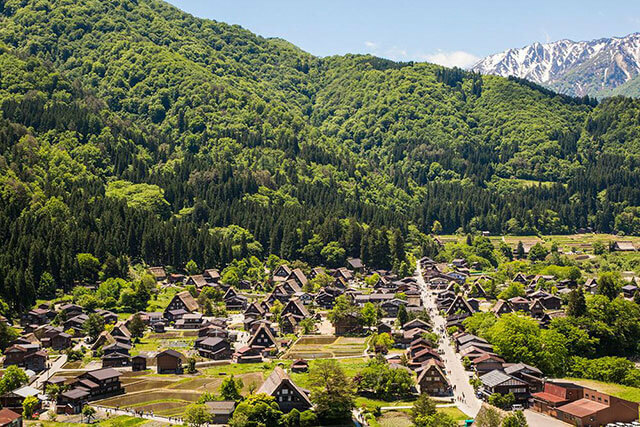 Typical scenery includes old wooden architecture against a backdrop of luscious forest-covered mountains while days out are packed with snow sports on dramatic slopes and bathing in hot steaming onsen before joining in one of the vibrant local festivals. As one of the most central prefectures of Japan, Gifu was once a strategically important prefecture and provided the ground for the Battle of Sekigahara in 1600. Today, Gifu’s location makes it accessible from the many surrounding prefectures while local traditions and customs have been preserved through the architecture and crafts such as sword-making and wood-carving. Sat among the Hida mountains in the north of Gifu Prefecture, Takayama City is one of the most popular preserved cities in central Japan. Old wooden tea houses from the Edo period (1600-1868) line meandering streets that lead on to the majestic green mountains that surround the city. Takayama comes alive in April and October with the biannual Takayama Festival, said to be among the country’s three most beautiful festivals. Not far away in the very northwestern corner of Gifu, Shirakawago exhibits equally old architecture but traditional of the mountain communities. Known as gassho-zukuri, the thatched-roof farmhouses of Shirakawago are tucked into the mountains where they are covered by a thick layer of snow in winter. Step inside to explore museums, restaurants, and traditional crafts or even stay overnight. As one of the prefectures home to the Japanese Alps, Gifu has an abundance of stunning scenery and ski resorts. The mountains welcome in keen walkers, while the most accessible points that guarantee good views include Shinhotaka Ropeway, where scenes of clouds sat among the snow-capped peaks are visible from the observation deck atop the mountains, and the 3,000-meter-high Norikura Skyline from which a 90-minute hike up brings you to Kengamine, the highest peak around. Onsen scattered around the area are another popular draw to the area with the mountain-based natural hot springs at Okuhida, as well as Gero Onsen and Hirayu Onsen. Gifu City, the prefectural capital, is home to Gifu Castle originally built in 1200, Mt. Kinka, and the Nagara River. The river is most famous as the setting for the city’s unique ukai fishing, a technique where cormorants are used to catch fish between May and October. As a passing point between Kyoto and Tokyo, one of the old walking routes across the country, the Nakasendo, passes through the southern half of Gifu Prefecture. While the majority of the beautifully preserved post towns of the Nakasendo route are in Nagano Prefecture, Magome, a little town of wooden Edo-style buildings, sits in the southeastern corner of Gifu Prefecture.